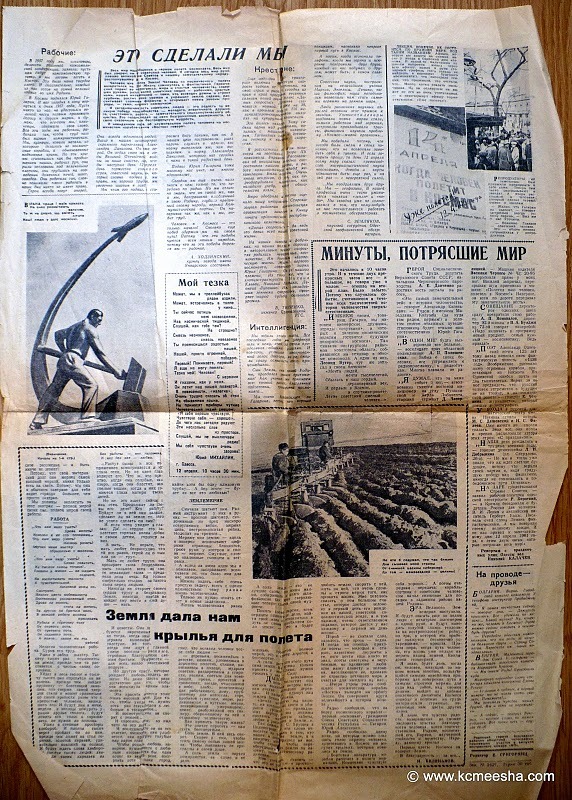 Just in time for the Cosmonautics Day from my Father’s archives – a never before seen this side of the Iron Curtain newspaper published on April 13, 1961. (click photos for a readable version). This extra edition is titled “It Happened!”. On the right side with the subtitle “In history – forever” there a story and a time-line of the flight. On the left there is an official announcement from the Government and the Central Committee of the Communist Party titled “Listen, Planet! – to the progressive humanity”. Dear Yuri Alekseevich (Gagarin)! I am extremely delighted to congratulate you with your outstanding heroic accomplishment – the first space flight on the spaceship “Vostok”. The entire Soviet people admire Your brave deed, which will be remembered for centuries as an example of bravery, heroism and courage in service to all humankind. Your flight opens a new page of the space exploration in the history of mankind and fills the hearts of the Soviet people with joy and pride for their Socialist Motherland. From the bottom of my heart I congratulate you with the safe return from space back to Earth. Hugs. See you soon in Moscow. Signed “N.Khrushchev” April 12, 1961. 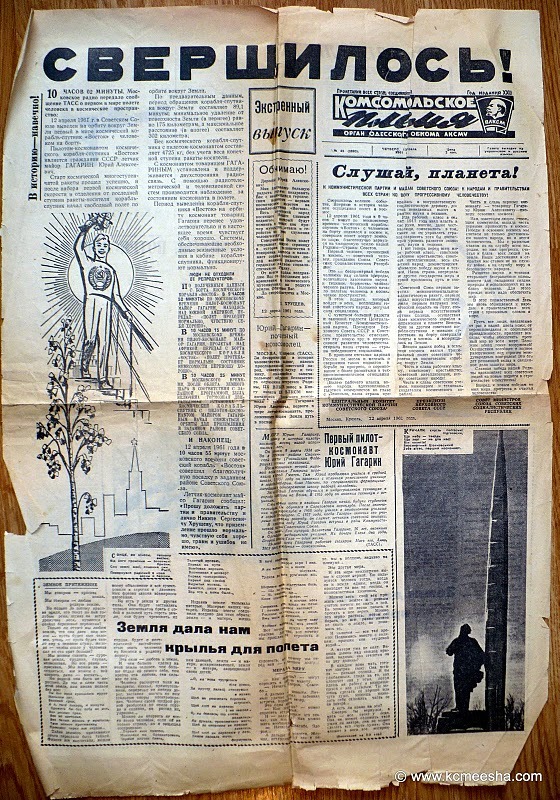 On the reverse side there are articles “We Did It!”, describing how the three main social classes – workers, peasants and intelligentsia contributed to the triumph of the space flight;”Minutes that shook the world!”;”Earth gave us wings for the flight” and other small items and poetry. 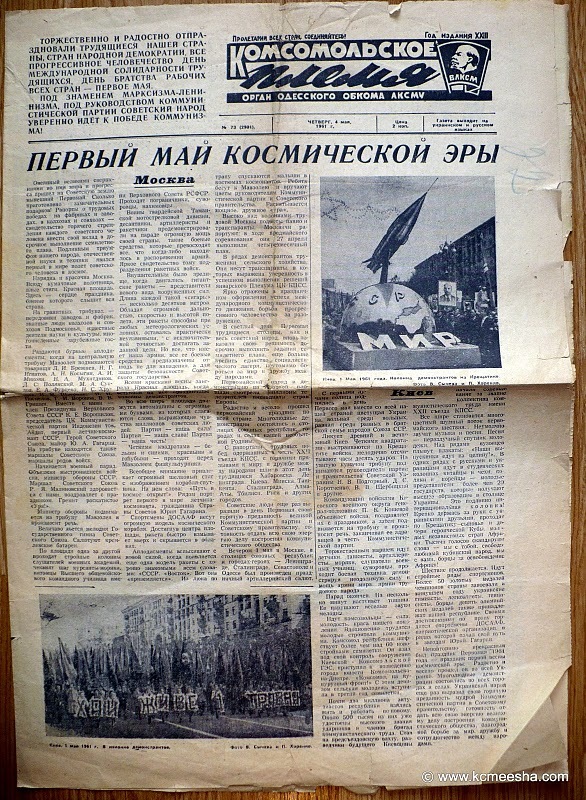 Bonus: A newspaper published on May 4th, 1961 titled “First Mayday of the Cosmic Era”. This song is called “Gagarin,I loved you” by Russian band Undervud.